Are you thinking about purchasing a home in or around the Woodbridge VA area? If you are looking to purchase a home you are on the right page. I will explain in detail how to buy a house in Woodbridge VA and surrounding area. You will get some great information right here. A step by step guide on what to do to purchase your first or second home, move up, downsize or purchase an investment property. You can find all resources for purchasing your home right here. I am a local Real Estate Agent, a Real Estate Investor, Home Owner, Animal Lover and I am looking forward to being your Woodbridge VA Real Estate Agent. Hire your Real Estate Agent. Be sure to select a local Real Estate Agent that knows about the area and knows the Real Estate process. Once you consult with a Real Estate Agent, the Agent will guide you through the entire process. There are a lot of things to consider but don't worry the right agent will be there for you from the beginning to beyond settlement. Get Pre-Qualified your Real Estate Agent can connect you with a local lender. Make can offer, your Real Estate Agent will guide you through the process and prepare an offer. You will discuss the best strategy with your agent on how to win the bid for your home. Depending on the market we are in there are different strategies to get the home you fell in love with. As long as you have a Real Estate Agent on your side that knows the market and how to negotiate on your behalf. Inspections are happening. Your agent will coordinate with you on what inspections you should get. The home buying process for many people begins with selecting the right real estate agent. Your real estate agent has been trained to provide you with the necessary expertise to find a home perfectly suited for you. Your real estate agent has access to a multiple listing services and will provide you with homes listed for sale that fit your preferred criteria. You will develop an agency relationship with your agent. This means that the real estate agent has certain duties such as always acting in your best interest and making disclosures required by law. 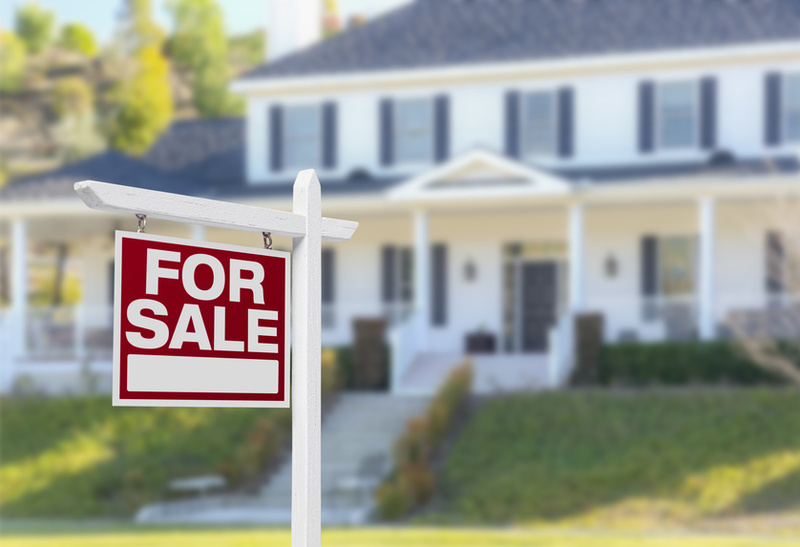 You should note that a seller’s agent has certain ethical obligations to a buyer as well. For example, any material adverse facts regarding the physical condition of a property known to the listing agent must be disclosed to the buyer. Communication with your real estate agent is extremely important as he or she will help you choose a home that satisfies your budget, needs, and preferences. You will need to discuss what you are looking for in a home with your real estate agent. How many bedrooms do you want? How many bathrooms? Do you want a backyard? Do you prefer a condo or a townhome? What neighborhoods are you interested in? Be sure to prioritize your needs to ensure your most important wishes are met. Remember, your real estate agent is an expert in finding homes for people so it is important to keep an open mind! Finally, your real estate agent will advise you to get pre-qualified from a lender in order to determine your potential loan amount and loan type. Learning this information will help you with the home buying process as it will fine tune your search criteria and give you a better idea of the price range you can afford. Selecting the right lender to assist you with financing your purchase is a very important part of the home buying process. If you do not already have a lender in mind, your real estate agent will be able to recommend one. While interest rates and points are important when shopping for a loan, you should also consider a lender’s reputation. It is essential that you find a loan officer who you can trust because you will be providing very personal information to your loan officer. Because of stringent regulations that lenders must follow, you will be asked for a lot of financial information. It will speed up the process if you gather as much information as possible in advance, including copies of tax returns, bank statements, pay stubs, credit card statements, as well as contact information for your employer. Communication with your lender is also of the utmost importance. You will be in contact with them until the day of settlement answering questions and providing them with requested documentation. It is imperative that you respond promptly to requests from your lender to ensure your loan gets approved as quickly as possible. After you fill out your loan application, you will receive a Loan Estimate (LE) from your lender summarizing your closing costs as well as giving you an estimated monthly payment (see Exhibit A). This usually arrives within 3 business days of your filling out the loan application. Your estimated monthly payment will include P.I.T.I. – Principal, Interest, Taxes, and Insurance. When calculating your house budget, you will also need to consider other monthly fees associated with the home including Homeowner’s Association dues, Condominium Association dues, and utilities Champion Tip: You may be asked to provide and sign the same document several times for your lender. Be prepared for this – lenders must follow certain regulations and this is a normal part of the process. Your real estate agent will draft the contract with terms and conditions that are acceptable to you. This is a legally binding document. You should review it in detail with your real estate agent. As your contract is drafted, there will be a few important items that will need to be determined such as your loan type, loan amount, amount of earnest money deposit (EMD), amount of seller concessions, if any, whether there will be a home warranty and who will be paying for it, whether there will be a home inspection or appraisal, and of course the proposed sales price. Champion Tip: The EMD is typically held by either your real estate agent’s office or Champion Title and will be applied as a credit on your Settlement Statement. In the contract, there is also space to fill out what is included in the sale of the property. Certain laws provide that all terms in connection with the conveyance of land be in writing. This means the contract, unless amended in writing, contains the final and entire agreement between the parties, regardless of any other terms or contingency representations orally made. So if you want that particular Tiffany chandelier in the dining room, write that in the contract! Rely on your real estate agent’s expertise in writing the offer. They have your best interest in mind and have the experience to write a competitive offer. Any addenda to the contract will contain supplemental terms that supersede any information contained in the body of the contract itself. For example, addenda may include information such as contract contingencies and deadlines, whether the property is located within a development that is subject to homeowners or condominium association laws or financing provisions, and other statutory disclosures. Once the contract has been drafted, your real estate agent will submit the offer to the seller. Negotiations are still possible until the contract has been signed by the seller and ratified. Your agent will review all negotiations with you and will provide their expert advice. If your contract is accepted, congratulations! You are on the way to purchasing your new home! Champion Tip: Champion Title’s legal counsel employs over a dozen real estate attorneys. Feel free to contact us with any questions you have about the contract. Your real estate agent will guide you through the inspection options available for your transaction. In addition, there are certain inspections that may be required by your lender. Some typical inspections performed are home, pest, well and septic, and radon inspections. A home inspection usually takes one to three hours. The purpose of the home inspection is to give you a better understanding of the physical condition of the structure. Your inspector will provide you with a written report of the findings. Some items the inspector will look for include: interior (non-cosmetic), foundation and basement, framing and structure, roof and attic, chimney, kitchen appliances, laundry, bathrooms, major household systems (plumbing, electrical, air conditioning, heating) and the garage. The inspector should explain any problems found, why they occurred and what repairs will need to be done. This is not a warranty of any kind. Problems that are found through various inspections may be addressed by asking the seller to repair the item(s) or for a credit on the Settlement Statement (subject to lender approval). An addendum must be executed with any agreements reached between you and the seller. 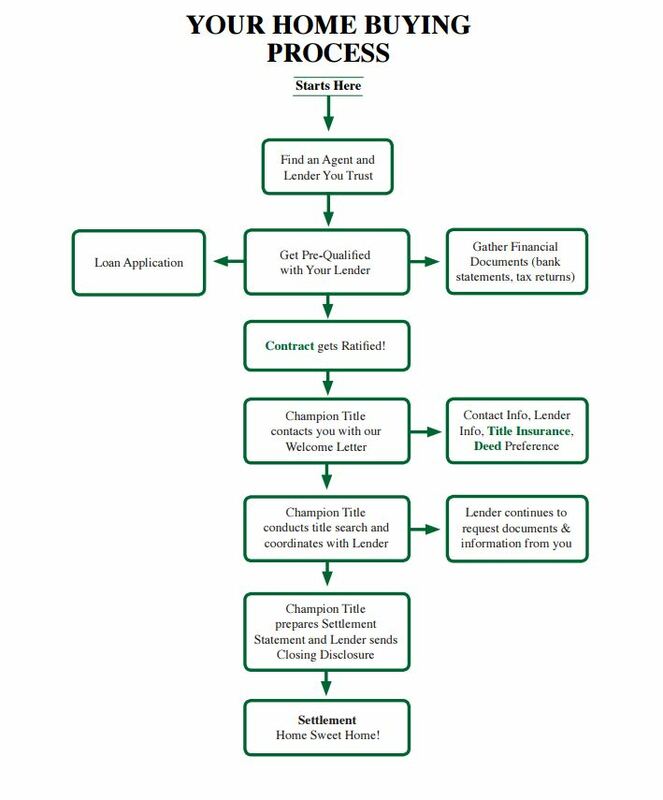 Prior to your settlement, Champion Title will work with your lender and real estate agents to provide fees that will assist your lender with preparing your Closing Disclosure. Once your loan is finalized, your lender will send you the Closing Disclosure itemizing your loan details and closing costs. Your lender will also send Champion Title closing instructions containing the details of your loan, which we use to prepare a Settlement Statement for the parties to review at settlement. The Settlement Statement contains figures for both the buyer and the seller and comprises information from your lender (your loan details), both real estate agents (commission figures, credits, reimbursements), the sales contract (sales price, any seller credits, amount of your earnest money deposit, when and where settlement will take place), Champion Title (our fees, title insurance, title services, settlement costs), the county or city wherein the property is located (taxes, recording fees and assessments), and homeowners or condominium associations, if applicable. We encourage you to review your Closing Disclosure prior to settlement and reach out to your lender to discuss any questions you may have regarding the closing costs. We are also available to assist with questions that pertain to fees not related to the loan, so please do not hesitate to give us a call a few days before settlement. The walk-through inspection is your opportunity, prior to settlement, to ensure that the property is in good condition and that any agreed upon repairs have been made. This is typically done within a few days of settlement. If problems are encountered during the walk-through, the real estate agents can work together to reach a resolution that is acceptable to both parties. If the seller will be occupying the property after settlement by use of a post-settlement occupancy agreement, another final walk-through inspection will be conducted once the sellers have moved out. Many different parties are involved in the purchase of your new home. In addition to you and your agent, the settlement also involves the sellers and the listing agent, the settlement attorney or licensed settlement agent from Champion Title and your lender. The processor from Champion Title who has been assigned to your file will help you coordinate a settlement date, time, and location. Champion Tip: If you cannot attend settlement, please let your processor know as soon as possible. We may be able to prepare a power of attorney to allow someone else to sign documents on your behalf or we may be able to send you the documents and have you sign them remotely in front of a notary public. Either of these options will require approval from your lender and our title insurance underwriter. Your settlement may take place on an agreed upon date by all the parties subject to the contract. Certain transactions, such as short sales and foreclosures, take longer since they require approval from the banks that have an interest in the property. Champion Tip: Transfer all of the utilities into your name and make sure your homeowner’s insurance is effective on the settlement date. Timely transfer of utilities will help you avoid turn off/turn on fees that some companies may charge! When you arrive at Champion Title for your settlement, you will be asked for a form of government-issued photo identification such as a passport, driver’s license, or military ID. If you plan on wiring your funds, wiring instructions will be provided to you before your settlement from your processor at Champion Title. Wire transfers are much preferred as they provide efficient and accurate transfer of funds on or before you get to the closing table. You should initiate the wire at least 24 hours in advance of settlement to ensure the funds arrive in time. If you have not wired your funds prior to settlement, you will need to bring a certified or cashier’s check for your down payment and closing costs.